You've simply got to hand it to the Germans, whose concentration of artistic talent has dominated European painting for at least the last decade and still shows no signs of diminishing. While art has always been a teutonic strength, dozens of home-grown artists are currently riding high in the contemporary scene. And perhaps it's fitting that, almost exactly a century after the first stirrings of German Expressionism, Germany's young artists - the YGAs - are again creating some of the most assured art to be found anywhere. Outstanding practitioners abound in all areas, but it's the strength of current German painting that's creating particular waves of excitement in the art world. 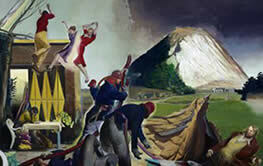 The explosion of talent seems partly fortuitous, partly related to factors including the rigorous academicism favored by former East German art schools - most notably the Academy in Leipzig, a small city which superstar painter Neo Rauch was the first to place firmly on the international art map. 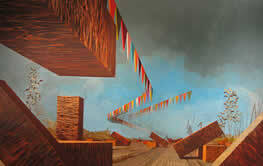 The buzz began in 1997 when Rauch won a local painting prize and with it, a solo show at the city art museum. Steeped in the pictorial tradition of the former GDR, Rauch's re-formulation of Socialist Realism provided a fascinating link to a visual culture largely swept away by re-unification. What's more, it soon became apparent that his astonishing mastery of technique was likewise indebted to Germany's past. Rauch's skills had been gained at the Leipzig Academy, an institution which, under communism, had stalwartly maintained traditional tuition methods untouched by the post-war avant garde. The wall which had isolated Eastern Germany from western Europe for 40 years had also, in the words of Arno Rink, former director of the academy and professor of painting "... allowed us to continue in the tradition of Cranach and Beckmann. It protected the art against the influence of Joseph Beuys." The German public was enthralled by their virtuoso painter, and it wasn't long before the rest of the art world tuned into the discovery. Although worldwide recognition of Rauch's work is in fact comparatively recent - his first solo show in the U.S. only took place in 2000 - he is now regarded as the father figure in what was to develop into a full-blown movement. 'Trailblazer' may be too glitzy a term to apply to such an intensely cerebral, considered artist, but it wasn't just critics and collectors who were captivated by Rauch's work. A number of young German artists thirsting for the rigor apparent in his painting headed to Leipzig for the same traditional training. Several of these form part of what is today known as the 'New Leipzig School', a formidable concentration of talent including Tim Eitel, Matthias Weischer, Christoph Ruckhärberle, Martin Kobe and David Schnell. At least some would agree that the group constitutes "the 21st century's first bona fide artistic phenomenon" (Life after Death: New Leipzig Paintings From the Rubell Family Collection), and a revival in figurative painting will certainly be seen as a major tendency of the opening years of the new millennium. Yet throughout Germany , startlingly diverse painters are producing work which, equally, ranks among the most significant of the moment. And the success of several of these artists is at least partly the story of another art school, one with an ethos dialectically opposed to the conservatism of Leipzig.